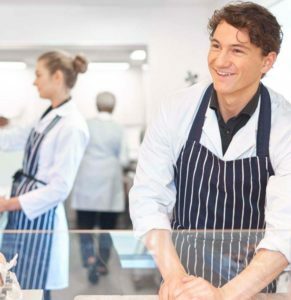 A simple apron can make a huge difference for your kitchen or front of house staff, not only in terms of hygiene levels but also setting a professional tone for service. Alsco head chef, sous chef and front of house aprons are available in a wide range of colours and styles to suit. 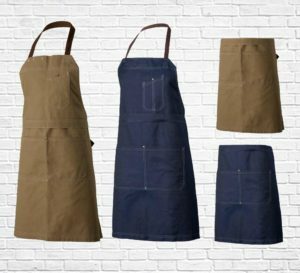 Choose from traditional white, black, butchers stripe or rustic cross strap aprons, in full, half-length or even adaptable to both. Our new apron can be worn in two stylish ways, halter bib or fold down for a waist apron, it’s super adaptable. Available in two colours Latte and Indigo with chocolate contrasting halter strap, waist ties, brass fasteners and contrast stitching, large front pocket, top pocket and hanging loop. Here’s both colours (indigo and latte) and how our new Adaptable Aprons can be worn as a halter of folded down as a waist apron. So adaptable! Double denim, one side dark denim, reverse your apron and find a new light denim look on the other side. On trend over the shoulder cross back straps, large front pocket for Ipad and pen pocket. Available on Alsco’s Managed Rental Service, we provide the aprons, collect them when they are used, wash, dry, press and deliver them back direct to your door. What could be easier? There’s no need to be a butcher to wear the Alsco striped apron, because we now see it worn front of house for a cool rustic look. 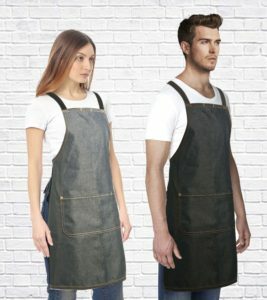 Available in full length with halter or as waist apron and they are all available on Alsco’s economical Managed Rental Service, so you can focus on what you do best. Alsco’s Classic Bib Apron always looks smart, especially in black when teamed with a crisp white shirt, providing a great contrast. 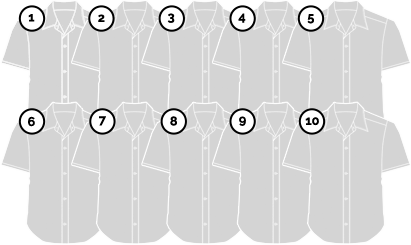 You can even have your business logo embroidered on the front to give it that extra personality. Alsco’s Bib Apron is also available in White for that super crisp look, and all our aprons can be set up on Alsco’s Managed Rental Service. We provide the aprons, collect them when they are used, wash, dry, press and deliver them back direct to your front door. What could be easier? Not sold on the look of a bib apron, then why not try Alsco’s Wrap Waist Apron. Always looks smart, especially in black when teamed with a crisp white shirt, providing a great contrast. 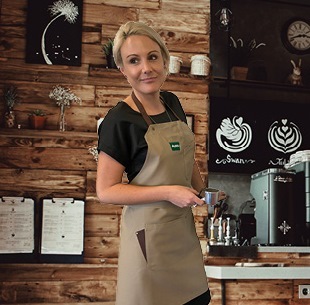 Alsco’s Wrap Waist Apron is also available in White for that super crisp look, or with a butchers stripe for a casual look and all our aprons can be set up on Alsco’s Managed Rental Service. We provide the aprons, collect them when they are used, wash, dry, press and deliver them back direct to your front door. What could be easier? Can’t wait to get your Alsco Managed Service? simply call ‘1300 659 892‘ and we can get you started, or use the contact form to the top right of this page and we will be in touch shortly. There’s a great range of options, from short waiter’s aprons to pinstripe butcher’s aprons to bib aprons, there are a wide range of options to perfectly suit you and your business. Super quality fabric that ensures each apron resists stains, heat and help protect from burns in the kitchen. It’s a completely hassle free service, Alsco will supply, clean, dry, press and deliver your aprons on a weekly basis straight to your doorstep. You don’t ever have to worry about staying on top of your restaurant’s laundry ever again.